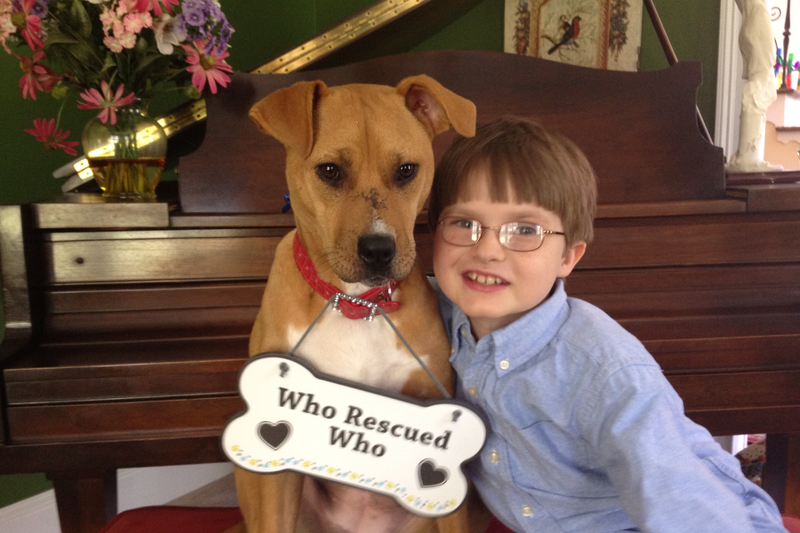 A Rescue Dog Changed This Autistic Boy’s Life Forever. This is the beautiful story of an Autistic boy and his dog, and how they helped one another. Jonny began exhibiting symptoms of Autism early on in his life. Sometimes, when his father would bring him to the deli to pick up meat, Jonny’s dad would place his order, and Jonny would begin screaming at the top of his lungs. Among other things, food gave him a great deal of anxiety. Additionally, the little boy would have almost no interaction whatsoever with the family dogs the Hickeys had at the time. The family’s situation, as it is for so many other families, was stressful and challenging – they just wanted a way to help improve their son’s life. Then something amazing happened. A terribly emaciated and near death Pit Bull had been found. She was near death. The rescue organization responsible for her care felt that she was in need of a fighter’s name to complement her fighting spirit, so that hopefully she would pull through. She was named Xena, and she would need that type of encouragement, because the situation was dire. Jonny’s mother came across the dog’s story and Facebook page and followed her recover. She also applied to rescue the dog. Thankfully, the dog pulled through, and out of hundreds of applications, the Hickeys were selected to give her a forever home. Upon bringing Xena home, the family noticed an immediate change in Jonny’s behavior. He was less anxious, more social, and had found a forever friend in Xena. He interacted with her in a way that he never done with the other family dogs in the past. Watch the video above to see Jonny and Xena’s beautiful relationship. If you were touched by this story of a beautiful autistic boy and his dog, please give this video a share using the buttons below to help raise awareness of the challenges of Autism and the benefits of having a dog as a friend. Thank you for your kindness. Have a beautiful day! Peace, love, light! 🙂 And also to you ❤ !! Two tough roads that led them to each other. May they experience lasting joy, good health, and peace. Tears in my eyes. Beautiful! Unfortunately, autism is a growing problem in each generation. To see the effect the dog has had on this beautiful boy, is a joy. My granddaughter has Asperger’s, and she has 7 therapy cats at home! They give her a sense of peace and help her with her anxieties. Reblogged this on The Forever Years.